Want to send a message to one of our directors? Click here! As a camper, Meryl spent many summers at Camp Judaea and views her summer overnight camping experiences as the most influential in her life. She attended the University of Georgia and graduated with a BS in Business Administration. She worked as a corporate recruiter for four years and then worked as a real estate closing coordinator. 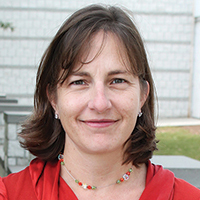 Meryl began her tenure at the MJCCA in 2005 as the Camp Central Registrar and was promoted to Camp Central Director in 2007. In this role, she significantly enhanced the camp registration process and Camp Central structure. In 2010, Meryl was promoted to MJCCA Day Camps Director of Operations and she became the Director of Day Camps in 2014. Meryl and her husband, Lenny, have three wonderful children, Nathan, Zachary, and Emily, and a dog named Murphy. 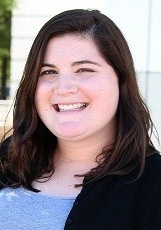 A native of Roswell, Georgia, Phoebe started at the MJCCA as a camp counselor for Camp Isidore Alterman in 2006. She continued to work with the day camp and after school program at the MJCCA while she completed her undergraduate degree at Agnes Scott College, where she graduated in 2010 with a BA in Sociology/Anthropology. Phoebe joined the Day Camps team full time in 2013 as Camp Central Assistant Director and began her role as Operations Director in 2015. She currently lives in Buckhead and loves to read, watch CNN, and travel to new places! Abby was born and raised in Baltimore, MD. She graduated with a BS in Communications and Rhetorical Studies from Syracuse University. 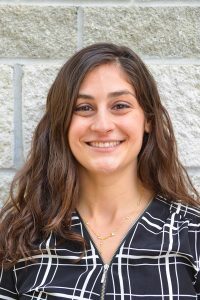 After graduation, Abby spent three years at the Roth Family Jewish Community Center of Orlando running all of their programming for children in kindergarten through tenth grade, including their after school and camp programs. She moved to Atlanta in 2014 and joined the MJCCA as Club J Director, a position she held for two years. Abby is excited for her third summer as a camp director! Abby and her husband, Dave, currently reside in Brookhaven. Since working as a camp counselor at the MJCCA in 2008, Mackenzie has been very involved with several departments at the JCC, ranging from Club J to Youth Sports. Mackenzie graduated in 2013 from Kennesaw State University with a degree in Psychology and a concentration in Applied Statistics and Behavior. 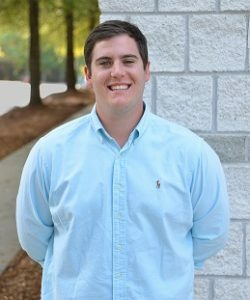 Following graduation, Mackenzie worked at Jacob’s Ladder Neurodevelopmental Learning Center in Roswell, where he was a neurodevelopmental teacher in a small group classroom for children with special needs and cognitive delays. Mackenzie currently lives in East Cobb with his wife, Hilary and black lab, Moose. Ilana began her professional journey at the Metairie JCC (in Louisiana) as the Assistant Day Camp Director. 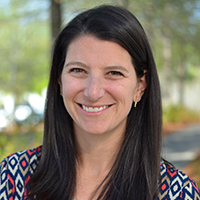 Ilana’s tenure was cut short due to Hurricane Katrina, but it brought her to Atlanta, where she began working as the Assistant Camp Director for Camp Judaea. She helped to successfully run Camp Judaea from 2005-2009. Ilana then joined the MJCCA, where she directed Barbara & Sanford Orkin Camp Chai for two summers. 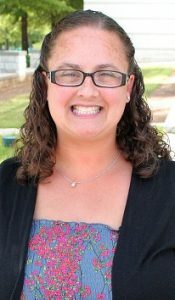 Now an integral member of the MJCCA Day Camps staff, Ilana looks forward to continually enhancing the programs and options for our campers! Ilana and her husband, Greg, live in Dunwoody and have two children, Payton and Hunter. Randi is an Atlanta native and spent many summers as a child coming to day camps at the MJCCA! After going to the University of Florida for college, Randi moved to Washington, D.C. where she worked as a producer’s assistant at Williams Gerard Productions and met her husband, Adam. After a few years, Randi moved back to Atlanta and started her own video montage company, Randodi’s Productions. She joined the MJCCA Day Camps Team in 2017 as the Director of Theme Camp Curriculums, and this summer, Randi is excited to be the new Theme Camps Assistant Director! 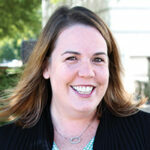 Randi and her husband live in Dunwoody with their two boys, Jonah and Logan, and their dog, Elphie. Stephanie has been working with The Lynne & Howard Halpern Drama Camp since 2012, and works year-round at the MJCCA as the Arts + Culture Education Director. She received her BFA in Theatre Arts from Boston University and also studied at the London Academy of Music and Dramatic Art. As a performer, director, and educator, Stephanie has worked professionally in theaters in Atlanta, Boston, New York, Edinburgh, and London. She is dedicated to theater education and tirelessly seeks to challenge, enlighten, and inspire children through the arts. Erin graduated from the University of Buffalo with a BFA in Dance. Erin has danced with Zodiaque Dance Company, as well as Buffalo Contemporary Dance Company. She was on the United States tap team in 1999 and 2000, and traveled to Germany to compete in the Tap Dance World Championships. Both years she placed in the World Medals. Erin worked as the Assistant Director of Administration for the New York Education Departments Summer School of Dance for five years before moving to Georgia, where she worked as the Artistic Director at a performing arts facility and owned Empire School of the Arts dance studio. Erin came to the MJCCA in 2007 as the Director of Dance. She loves being part of this amazing JCC and seeing campers fall in love with dance like she did as a child. 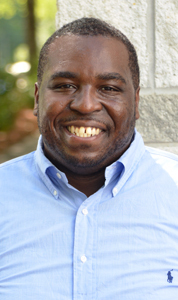 Zachary (Zak for short) joined the MJCCA in August 2015 after finishing his master’s degree in Sports Management at the University of Florida. Zak most recently coached in the European Maccabi® Games, winning a gold medal in the junior boys’ division. Previously, Zak served as a Graduate Assistant for the Florida Gators Men’s Basketball team, where he saw them to multiple SEC championships and a trip to the Final Four. Zak was born and raised in Miami, FL and was involved in the Maccabi® Games and other programs at the Dave and Mary Alper JCC for more than 10 years. Ronald has been with the MJCCA for seven years. During that time, he has filled many roles from Sports Activity Director to Preschool Sports Teacher, and most recently was promoted to Athletic Programs Coordinator. Ronald has also worked with the Maccabi® Games. While working with Maccabi®, Ronald led his Maccabi® Flag Football team to two successful seasons taking the Silver Medal in back to back summers of 2015 and 2016. Ronald was also the recipient of two Midot Medals, which is one of the most prestigious awards that you can receive at Maccabi®. In his free time, he enjoys spending time with his wife, playing in the Co-ed sports leagues at the JCC, and reading. Sarah, a native of Atlanta, has been a member of the MJCCA and even attended preschool at the Weinstein School. She graduated from the University of Georgia in 2016 with a degree in Human Development and Disability Studies. After graduation, she was a Neurological Development teacher for students with behavior challenges at Jacob’s Ladder School in Roswell for two years. She began working at MJCCA Day Camps as the Special Needs Teen Camp Coordinator in 2014 and continued on to become the Director of Inclusion in 2018. 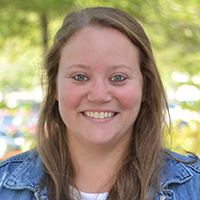 She now is currently pursuing her Masters in Applied Behavior Analysis and works year-round at the MJCCA as the Inclusion Director for The Blonder Family Department of Special Needs and Day Camps. Stacey’s involvement in gymnastics began in 1976 after the Montreal Olympics and watching Nadia Comaneci earn the first perfect 10. She has been involved in all aspects of gymnastics—as a competitor, coach, judge, and even an organizer. She earned a degree from Middlebury College in International Politics and Economics with minors in Spanish and Russian. Following her college graduation, Stacey lived in Russia for two years, and she then moved back to the states to work for the 1996 Olympics as Assistant Housing Manager for the Olympic Village. She joined the MJCCA in February 2014 and currently lives in Dunwoody with her husband, their two children, and her dog named Nelson. Allye is excited to be entering her eighth year of camp here at the MJCCA. A native of Roswell, GA, Allye has been coaching gymnastics for 14 years, beginning in high school. She has worked at gyms in Roswell and Athens, where she graduated from the University of Georgia with a degree in Public Health. She has also lived in Charleston, SC, where she worked for the city of Charleston’s employee wellness division. Allye started coaching at the MJCCA in 2011 and became the Assistant Gymnastics Director in January 2014. She feels very fortunate to be part of such a wonderful community and is looking forward to another great summer at the MJCCA! Adam was born and raised in Charlotte, NC. As a junior tennis player, he was ranked in the state’s Boys 18U Top 10. He won the NC State High School Doubles Championship in 1974 and 1975, and he played Division 1 Tennis at NC State University from 1975-1977. Adam joined the MJCCA staff as a Tennis Professional in 2013, and two years later he was promoted to Director of Tennis. Before working at the JCC, he was a Head Tennis Professional for the PGA Tour Superstores in Atlanta, and he owned and operated The Packaging Store in Dunwoody, which specialized in shipping furniture, fine art, and antiques. Adam is USPTA and USPTR certified, a gold member of the Wilson Advisory Staff, and a member of the GPTA. In his spare time, he enjoys playing competitive tennis and going to the movies.